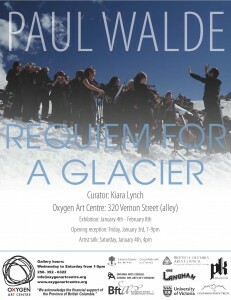 Small Town Films was involved in the production, shooting and editing of the video components of Requiem for a Glacier, an audio/video installation by artist Paul Walde, and exhibited at Oxygen Art Centre in Nelson, B.C. In this era of environmental transformation, most people now understand that the ravages of global warming pose a real threat to the future of our planet. The sound and video installation Requiem for a Glacier by artist Paul Walde explores the boundaries of a growing national and international movement of art practices produced with consideration for the wider impact of the work and its reception in relationship to its environment, where a representation of nature has been replaced by direct intervention. Because of the physical demands required to access the site-specific glacier location and because of the sheer number of volunteers who participated, this project exemplifies to what extremes a community’s engagement with an issue can lead them and how powerful unified creative expression can be. 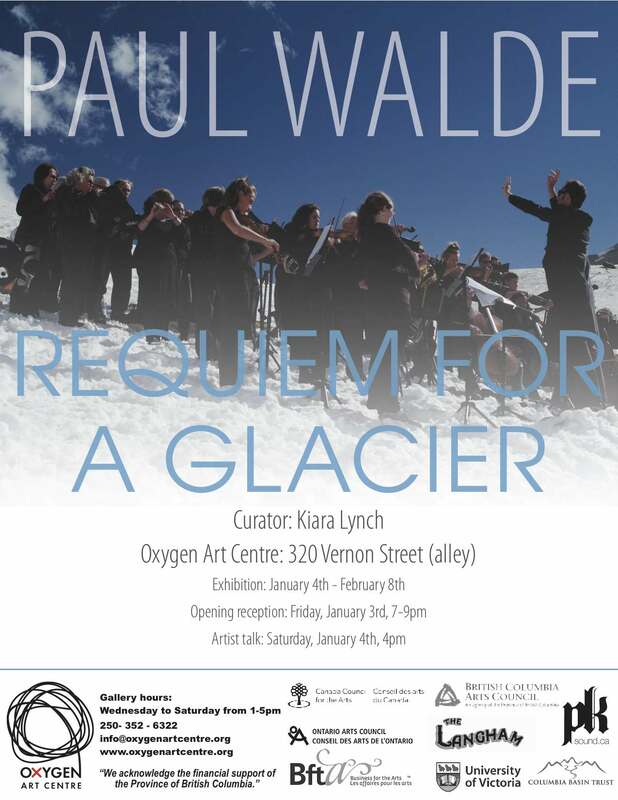 Requiem for a Glacier is a “total work of art” in that it depended on the interconnection of audio, visual and performing arts mediums with scientific fact and community engagement to bring it to fruition. By combining cerebral information with emotional experience this work provides an original platform for engaging with our environment. Information such as temperature records for the area, the name Jumbo, and a Latin translation of the BC government’s press release for the announcement of a year-round resort community at the site in the middle of a nature conservancy, were converted by Walde into music notation and a libretto. It is because of this interconnectedness of science with creativity that works like Requiem for a Glacier not only show us but can make us feel the issues we are dealing with as a society. Oxygen Art Centre gratefully acknowledges the support of Columbia Basin Trust, British Columbia Arts Council, Canada Council for the Arts and the Government of British Columbia. As well as the creative partnership with The Langham Cultural Centre and business sponsorship from PK Sound, Big Cranium and Business for the Arts, and the generous support from individuals within the community.